In the early stages, Palttala who, as for any Finn, likes slippery tracks, claimed the provisional pole, from Christophe Bouchut (SRT Corvette C5-R) and Anthony Beltoise (Euroflash Autovitesse Viper). However, with the track drying, most of drivers pitted to change their tyres. When the tyres were up to temperature, the positions were changing unceasingly. 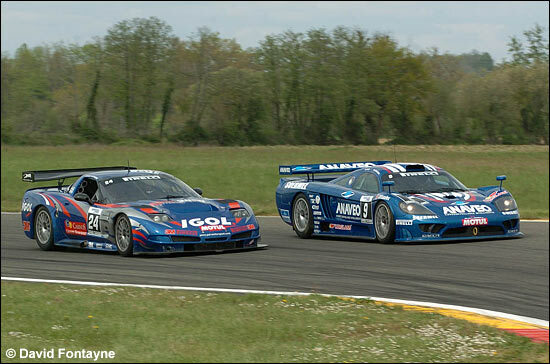 Bouchut was quickest, but Giroix (First Racing Viper) improved, and so did Alliot (PSI C5-R), Beltoise, then Ayari (Oreca Saleen S7R) and Dupuy (Protek Saleen S7R). Jérôme Policand (SOFREV Larbre Ferrari 550 Maranello) had a puncture and stopped on the circuit. 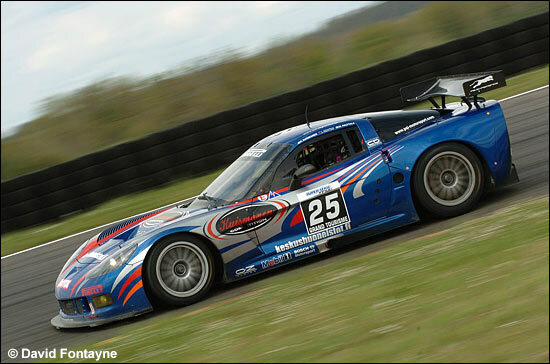 In the very last momentst, Soheil Ayari set the eventual pole position, ahead of Frédéric Makowiecki (Mirabeau Viper), Beltoise, Palttala, Bouchut, Dupuy and Besson (First Racing Viper). In the GT2 Trophy, Narac (IMSA Porsche 996 RSR) and Prunet (Protek 911 RS) were fighting hard and so did Loger (996 Cup), Rodrigues (996 Cup) and Bourdais (Dodge Viper GT3) in the French Cup. All drivers pitted when the track began to dry and changed their tyres. 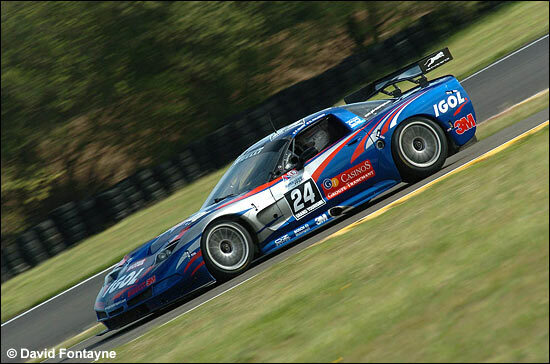 Narac claimed the GT2 pole, ahead of Rambeaud (Ferrari 550 Maranello GT2) and Prunet. 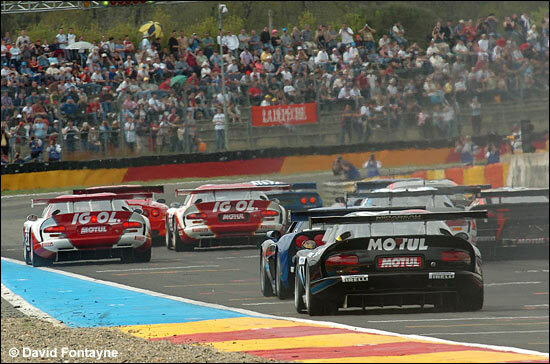 In the French Cup, Loger was three seconds quicker than Bourdais and Prunet. Soheil Ayari was first into turn 1 (below), ahead of Markus Palttala (PSI C6.R), who had a great start from the second row, Makowiecki (Mirabeau Viper), Bouchut (SRT C5-R), Dupuy (Protek Saleen S7R), Beltoise (Euroflash Autovitesse Viper), Alliot (PSI C5-R) and Lasserre (Tarrès Team Viper). 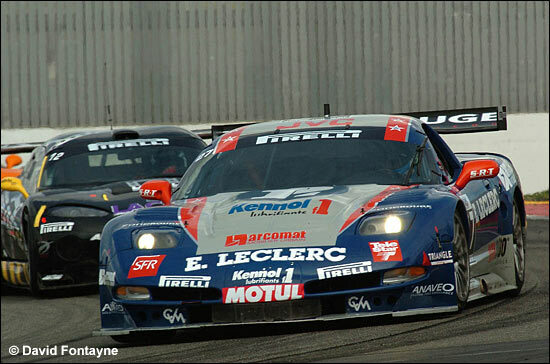 The fuel pressure of the Larbre Ferrari 550 Maranello was dropping and Jérôme Policand became the first retirement. Four men were pulling away from the field: Ayari, leading ahead of Palttala, Bouchut and Dupuy. Positions did not change until the driver changes, the gap fluctuating according to the traffic and the backmarkers. Palttala (above) was first to pit but had a problem with his belt and his steering wheel and lost some time. So, after the driver changes, Hernandez (Oreca Saleen) had a twenty second lead ahead of Lebon (SRT Corvette C5-R), Blanchemain (Euroflash Autovitesse Viper) and Debard (Tarrès Team Viper). Blanchemain and Debard made contact and Blanchemain lost many positions. Debard moved up to second place but was out of petrol and retired, as did Fiat (Protek Saleen), but in the Saleen’s case because of a rear right puncture. Bruno Hernandez crossed the finish line as a winner, ahead of three Corvettes: Yvan Lebon (SRT C5-R - below), Pertti Kuismanen (PSI C6.R) and David Hallyday (above) who had a great fight with Bornhauser (VBM Viper). 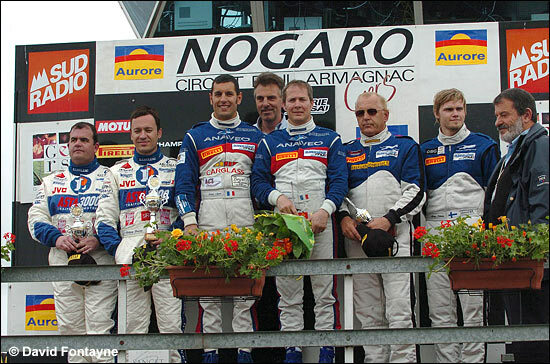 In the GT2 Trophy, Raymond Narac and Michel Lecourt (IMSA Porsche 996 RSR) led the race from start to finish and were winners ahead the Monteiro brothers who had to pit, the air intake being blocked, but who succeeded in passing Mouez and Prunet (Protek 911 GT3 RS), who finished in third place. 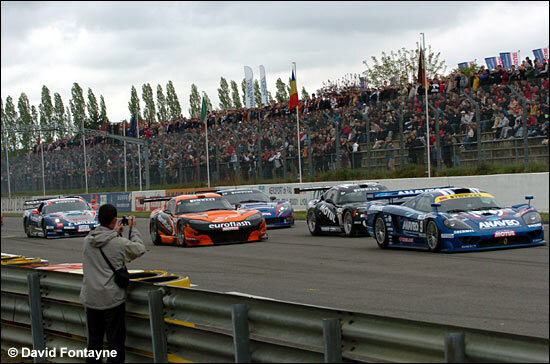 In the French Cup, Patrick Bourdais (Larbre Dodge Viper GT3) took the lead in the early stages, but David Loger (Pilotage Passion Porsche 996 Cup) took advantage of the traffic to overtake Bourdais and to widen a gap. 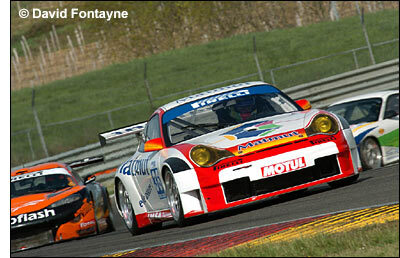 Philippon / Labescat (Espace Racing Porsche 996 Cup) finished in third place as in Sunday.